Research has shed new light on genetic processes that may one day lead to the development of therapies that can slow, or even reverse, how our cells age. A study led by the University of Exeter Medical School has found that certain genes and pathways that regulate splicing factors – a group of proteins in our body that tell our genes how to behave—play a key role in the ageing process. Significantly, the team found that disrupting these genetic processes could reverse signs of ageing in cells. The study, published in the FASEB Journal, was conducted in human cells in laboratories. Aged, or senescent, cells are thought to represent a driver of the ageing process and other groups have shown that if such cells are removed in animal models, many features of ageing can be corrected. This new work from the Exeter team found that stopping the activity of the pathways ERK and AKT, which communicate signals from outside the cell to the genes, reduced the number of senescent cells in in cultures grown in the laboratory. Furthermore, they found the same effects from knocking out the activity of just two genes controlled by these pathways—FOX01 and ETV6. Professor Lorna Harries, of the University of Exeter Medical School, who led the research, said: "We're really excited by the discovery that disrupting targeted genetic processes can bring about at least a partial reversal of key elements of the ageing process in human cells. This suggests that they could be an important aspect in designing therapies that could keep us healthier as we age. Our ultimate goal is to help people avoid some of the diseases partially caused by ageing cells, such as dementia and cancer." The ERK and AKT pathways are repeatedly activated throughout life, through aspects of ageing including DNA damage and the chronic inflammation of ageing. The research suggests that this activation may hinder the activity of splicing factors that tell genes how to behave. This, in turn, could lead to a build-up of senescent cells—those which have deteriorated or stopped dividing as they age. To stop the activity of the ERK and AKT pathways, the study used inhibitors which are already used as cancer drugs in clinics. When the pathways were disrupted, the team observed an increase in splicing factors, meaning better communication between protein and genes. They also noted a reduction in the number of senescent cells. 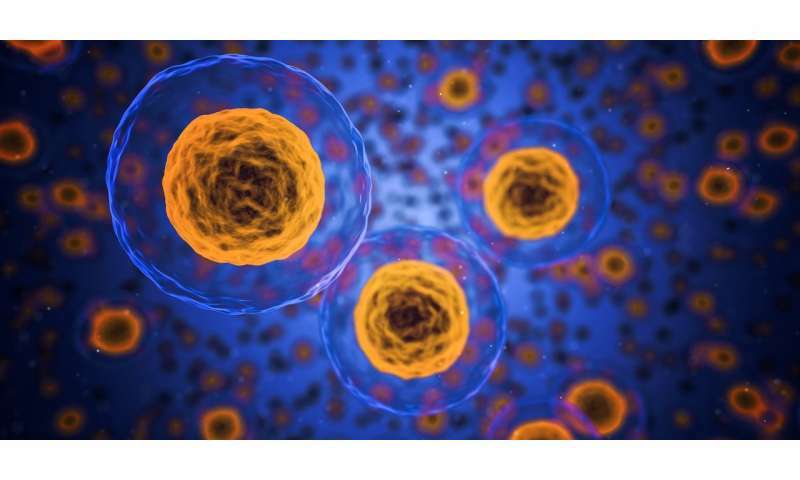 Researchers saw a reversal of many of the features of senescent cells that have been linked to the ageing process, leading to a rejuvenation of cells. Dr. Eva Latorre, of the University of Exeter Medical School, who carried out the research, said: "This study is part of a fast-evolving body of work into how we age. We used compounds that are already widely available in clinics for cancer – and are known to be relatively safe. It's still early days and we need to understand far more about the complex relationships of how our cells and genetic processes influence ageing, yet it's an exciting contribution to how we may one day be able to influence healthier ageing." The study, titled "FOXO1 and ETV6 genes may represent novel regulator splicing factor expression in cellular senescence," is published in the FASEB journal.